You’re catching me on a really good week. I’m fresh off a weekend of recharging with some girlfriends, there’s carrot cake cheesecake in my fridge, and I’m a few days away from a mini family reunion. All this, plus Easter just around the corner, makes for a gal who is feeling ultra-thankful today. We don’t really shy away from the issues here. There’s lots of real talk and nitty gritty and probably a little bit of TMI from time to time. My goal here is always to fill your bellies with delicious treats, yes, but I also feel responsible for being transparent here too. Anytime there’s sharing of life stories, I think it’s really important to remind each other to rejoice in the victories, both big and small, way more frequently than we dwell on the hard stuff. Celebrating the things we have to be joyful about doesn’t mean our lives are without difficulty or that we have to put on a facade, but it’s healthy to remind ourselves of all the good that exists in our lives. Chances are there’s plenty to feel proud of. So today, I gotta tell you, I’m feeling like a million bucks. This is a hard, hair-on-fire-busy kind of season, but I totally recognize that I get to do it with people who love and value me. That’s rare sometimes, right? To know that there’s people rallying behind you, people championing the way ahead of you, and a handful of folks to cheer you along at all the stops in between is such an incredibly blessing to experience. This has been a trying period of life, but it’s also been one filled with inspiration, unwarranted encouragement, and lots of love from unexpected (and expected) sources. I’m just so incredibly grateful. Maybe that’s you today. Maybe you’re in season where your cup is running over on all sides. 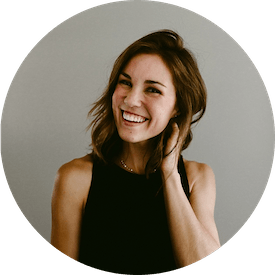 You might be finding wins around every turned page in a story where you’re the leading lady. If this is you, don’t forget to relish in this season. Share gratitude with the people on your team and take extra time to love on the ones in (and out of!) your circle that need the encouragement. At the same token, if this isn’t you and if you’re struggling on a road loaded with potholes and blockades, keep your chin up. Celebrate the tiny victories, no matter how lame or insignificant they may feel, and press on. Surround yourself with people who will help you stand when it’s hard to do so on your own. And remember that whatever you’re feeling is just an indicator, not a dictator, of your circumstances. You get to choose how you play the cards that you’re dealt, and my hope is that you play them like a champ. So this carrot cake cheesecake. It seems fitting to talk about this hearty dessert fit for sharing during Easter season. I’m always reminded of all the cool things I have to be thankful for this time of year, and there is no shame in being really grateful for a cake, cheesecake, and 9 extra slices for your favorite friends. Am I right? 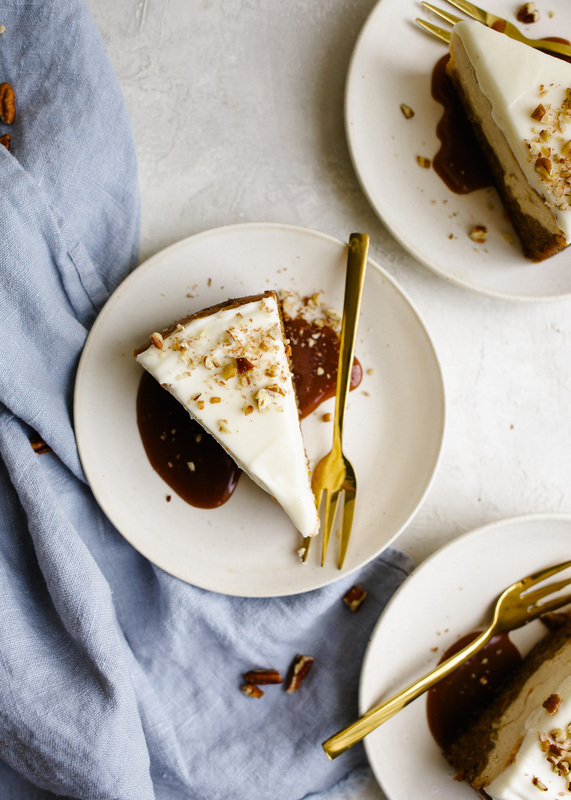 I’m sharing today’s carrot cake cheesecake with my pals at Kerrygold. I love products that can elevate treats that are already special all on their own, and Kerrygold is one of those trusted products for me. Here, their unsalted butter lends depth of flavor and moisture to the cake layer of this cheesecake. Truly, I am so proud to bolster up their butter, because it is the actual bomb. 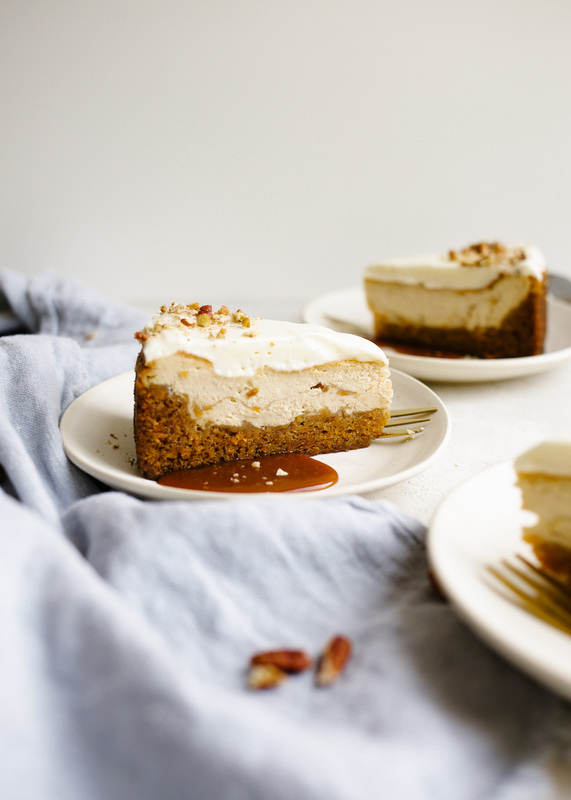 This carrot cake cheesecake is basically a skinny layer of carrot cake topped with a brown sugar and cinnamon cheesecake and then slathered with a cream cheese frosting (drool). It’s over-the-top and extravagant in every way possible, but honestly, don’t we kinda love that sometimes? 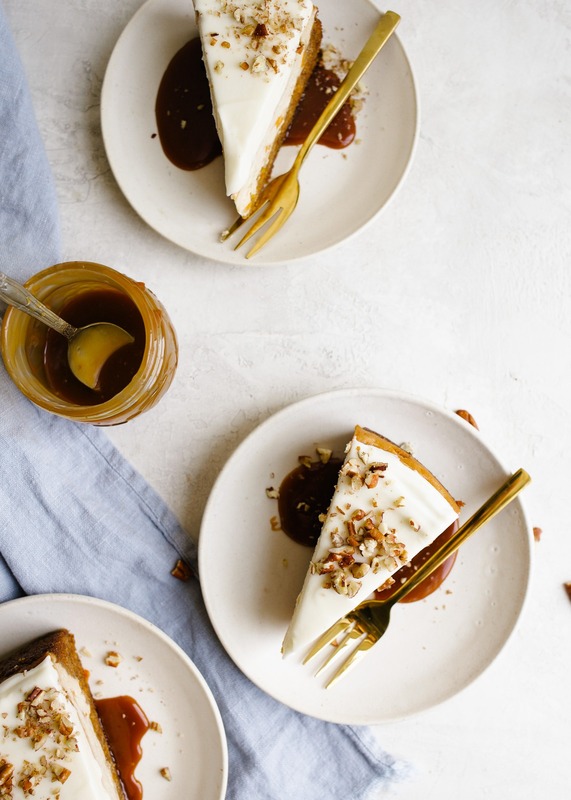 This carrot cake cheesecake is a great alternative to all those carroty desserts you’ll be making for the Easter bunny this year, and honestly, I think you’ll find it’s really hard to top this one. 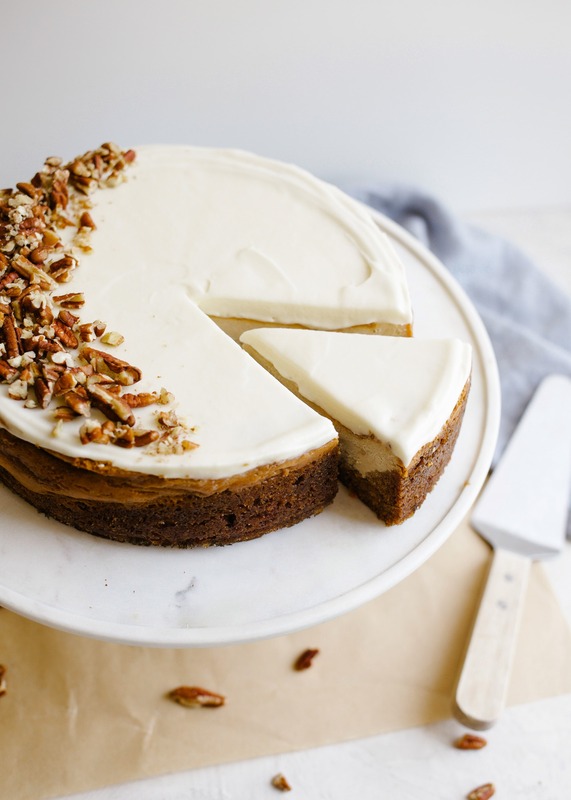 To make this carrot cake cheesecake, we start with the cheesecake layer. Cream cheese, brown sugar, eggs and heavy cream whip into a cheesecake that is extremely flavorful and creamy. This is not a super dense cheesecake but it’s not a fluffy Japanese one either. It’s kinda like the cozy cousin to both of those and it’s perfect for topping the carrot cake. Set the batter aside while you prep your carrot cake. Here, we’ve adapted my favorite carrot bundt cake into a simple batter than comes together easily. Spoon alternating layers of carrot cake and cheesecake batter into a 9″ springform pan and bake in the oven until set. Getting all that batter baked before it’s too brown is a little tricky, so if you notice the top of your cake getting dark before you’re close to the end of bake time, just tent it with a piece of foil to protect it. The frosting for this carrot cake cheesecake is totally optional, but I decided upon it to provide a finished look for the cake. The leavening in the cake batter puffs and makes for an imperfect top to the cheesecake, so to compensate I added frosting! Just trim any craggy edges off the top of your cake to smooth it as much as possible and then slather on the frosting. It adds an extra punch of sweet and helps to adhere all those toasty pecans to the top. WINNING. 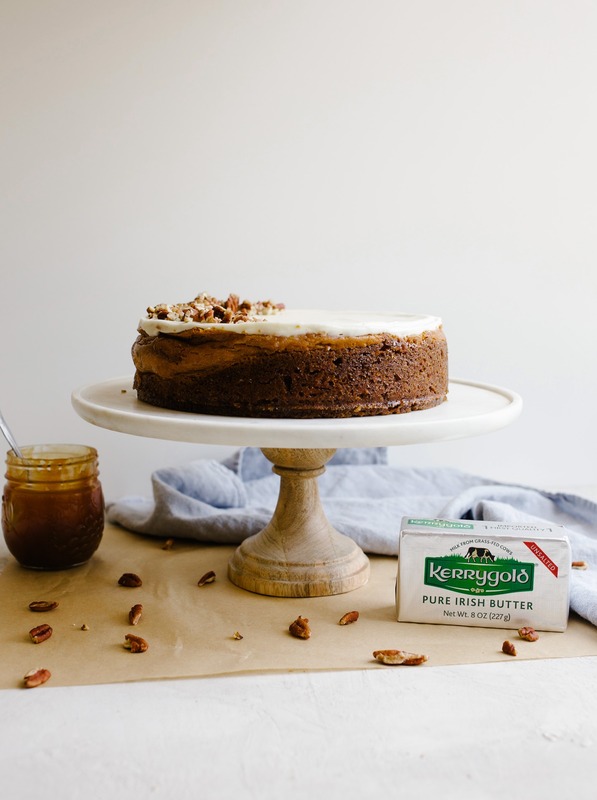 This carrot cake cheesecake is a major win thanks to my friends at Kerrygold. I hope you all will consider supporting such an excellent product, especially for decadent desserts like this. I also hope you’ll count up all your other wins this week and find some room for gratitude no matter where you are. If you need a little encouragement, feel free to drop me a line. I’d love to be the one to share it with you this week. Hugs and love and happy baking to you all! 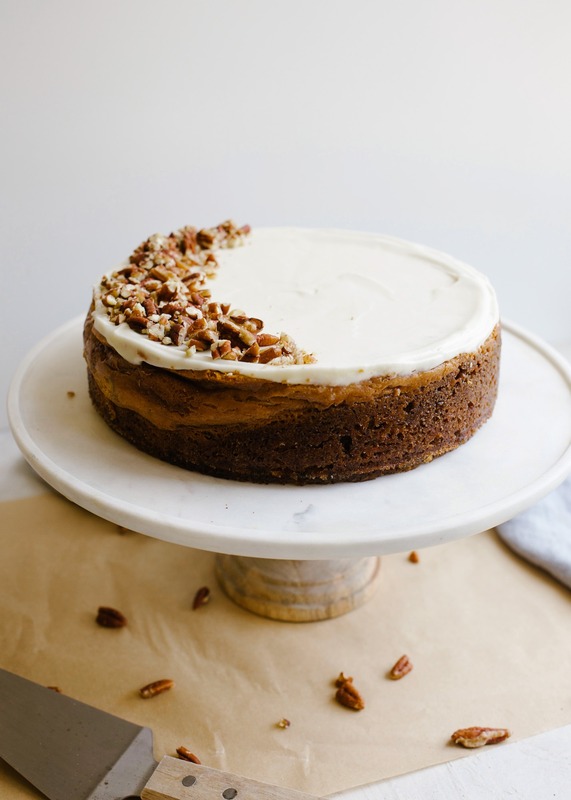 This carrot cake cheesecake is a mix of two favorite desserts. With a brown sugar cheesecake and moist carrot cake layer, this dessert is over the top delicious! Preheat the oven to 350 degrees and wrap the exterior of a 9” springform pan in a sheet of foil. Lightly grease and set aside. In a large bowl or the bowl of a stand mixer begin to prepare the cheesecake. Cream the cream cheese on medium speed using the paddle attachment for 2 minutes. Scrape the sides of the bowl and add the brown sugar, beating an additional 1 minute. Add the eggs one at a time and beat for an additional minute. Scrape the sides of the bowl and add the heavy cream, vanilla, and cinnamon and stir to combine. Be sure no large clumps exist. If there are a lot of large clumps, your cream cheese may not have been entirely room temp and you make need to strain the mixture. Set aside the cheesecake batter while you prepare your cake batter. In the same bowl, now empty, beat the melted butter, eggs, sugar, and vanilla on medium speed for 1-2 minutes until smooth. Add the flour, baking soda, cinnamon, and salt and stir just till combined. Fold in the finely grated carrots. Spread half of the prepared cake batter into the bottom of the pan. Spoon about half of the cheesecake mixture on top, taking care to cover every bit of cake batter you see. Do no swirl or spread the mixtures. Spoon the remaining cake batter on top of the cheesecake batter and then finish with the remaining cheesecake batter. Be sure no parts of the cake are exposed or you could have bit chunks of cake burst through the top of the cheesecake. Bake in the preheated oven for about 1 hour. If you notice the top of the cake is already dark by about 35-40 minutes into the baking, gently tent the top with a sheet of foil. Cheesecake is done when the center appears set and the cake as a whole only barely jiggles. It won’t look liquidy or watery under the surface of the cake. Turn the oven off and allow it to rest in the warm oven for 1 hour, then cool entirely in the fridge. Just before ready to serve, prepare the topping. Cream the cheese and butter on medium speed until smooth. Add the sugar until combined and then drizzle in the whipping cream and vanilla. Beat for about 45 seconds or until the mixture fluffs up. Remove the cake from the pan and trim off any severely uneven edges. Smooth the topping on top of the cheesecake and garnish with chopped pecans. Enjoy! Hi! This is so wonderful, will attempt it for Easter. Quick question do you use a waterbath to bake? Is that caramel sauce you have on the plate. I can’t wait to try this! 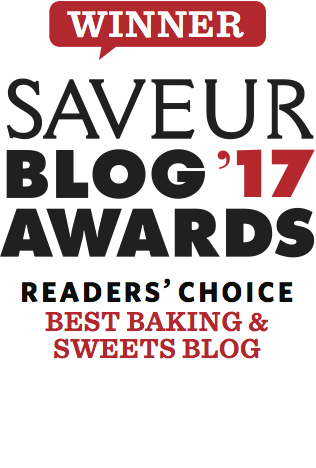 One question – Your recipe seems to make a quadruple layer dessert (carrot cake, cheesecake, carrot cake, cheesecake) but the pictures seem to show a double layer dessert (carrot cake, cheesecake) – plus the icing layer. Is this dessert 2 layers or 4 layers? Much to be grateful for! Thanks for the reminder. And thanks also for saving me a slice of this cheesecake! Love! I love your heart and your words! It’s a joy to relish in the wins and support each other in the struggle. 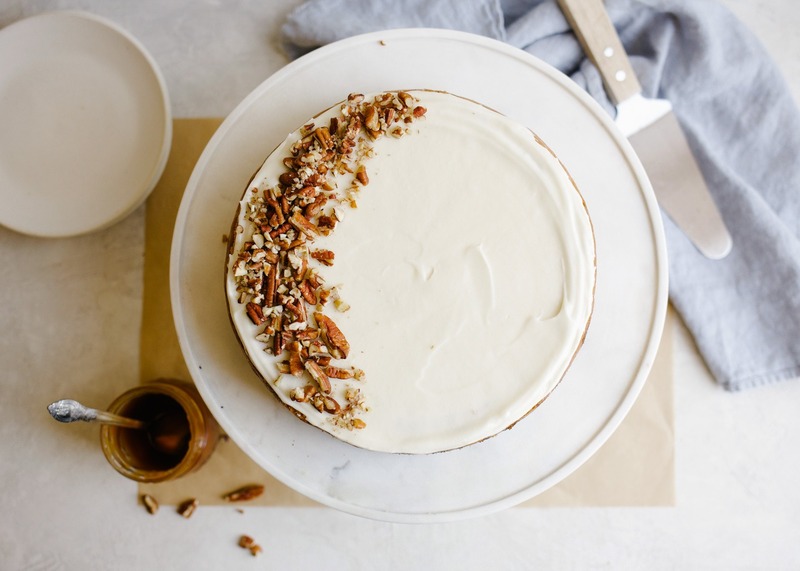 I LOVE carrot cake and can’t wait to try it!